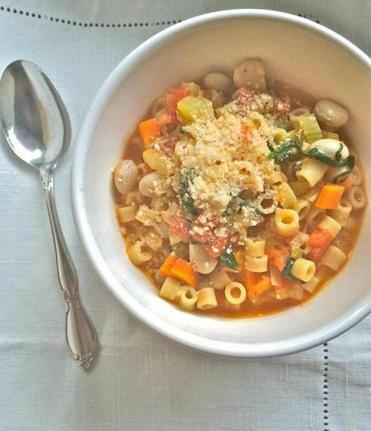 Literally pasta and beans, the Italian classic pasta e fagioli is a simple, hearty vegetarian stew with a robust tomato flavor and a creamy consistency, thanks to the starchiness of beans and pasta in the same pot. Early fall is the ideal time to make this because it takes advantage of farmers’ market ingredients. Tomatoes are still available, and cranberry beans are also in season. Other times, use onions in place of leeks, dried beans, and canned tomatoes. The humble pasta and beans make this dish reliably delicious. 1. Turn on the broiler. Lightly oil a large baking dish. 2. Cut the tomatoes horizontally and set them, cut sides down, in the dish. Broil 6 inches from the element for 5 minutes or until tomatoes start to char; cool. 3. Pull off the tomato skins and coarsely chop the flesh. 4. In a soup pot over medium heat, heat the olive oil. Add leeks, carrots, celery, oregano, salt, and pepper. Cook, stirring often, for 8 minutes or until the vegetables soften. Add the garlic and cook, stirring, for 2 minutes. 5. Add the stock, water, bay leaf, and beans. Cover and cook, stirring occasionally, for 30 minutes, or until they are almost tender. 6. Turn the heat to low. Add the pasta and tomatoes to the pot, cover with the lid, and continue cooking, stirring occasionally, for 10 minutes, or until the pasta and beans are tender. Add more water during cooking if the pan seems dry. Remove bay leaf. 7. Add the spinach, taste for seasoning, and add more salt and pepper, if you like. Serve with Parmesan.